Let me set the stage. Mediterranean cruise. Bluer water than you can believe. Bluer sky that you can imagine. Sunshine for days to tan the skin and warm the soul. And ports of call in some of the most incredibly historic, stunningly beautiful cities across Greece, Sicily, Italy, Spain and Croatia. Who could ask for a better vacation? It truly was the stuff a photographer’s dreams are made of, with a few lessons learned for the next time I set sail! When cruising the Mediterranean it’s hard to really go in depth at any one stop. I had the opportunity to sail on the Oosterdam with Holland America on a 10 day Mediterranean cruise and I had to really manage my expectations ahead. I was certainly excited to get a taste of this part of the world, but I knew it would be just that – a taste. A brief glimpse to walk the cobbled streets and soak in the culture before, too soon, moving on to the next destination. If photography is important to you, like it is to me, you definitely need to consider that a cruise might not be the best choice for capturing the best images at every city since you don’t have any control over your schedule. Some of the most stunning photos tend to be around sunrise and sunset, but often times you are still sailing at sunrise, docking by noon, and sailing away before sunset. be on deck as you’re pulling into and out of the ports of call to capture some of those best light moments. book excursions that really focus on street photography and local living in the middle of the day. Street photography tends to lend itself better to action and movement and candid moments during any time of day! Or, if you have a longer time in the port of call, consider doing your own thing and really crafting the day around photography from start to finish. find indoor locations like churches at the hottest, brightest part of the day, and look for outdoor areas with open shade (think near tall buildings or under groves of trees). If it’s just too hot or too bright, don’t be afraid to put the camera away and just enjoy the moment and live the experience. 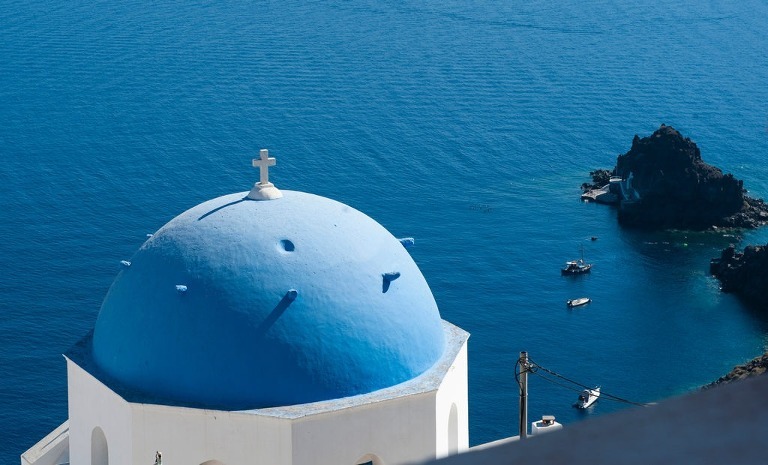 The star of the show – Santorini! 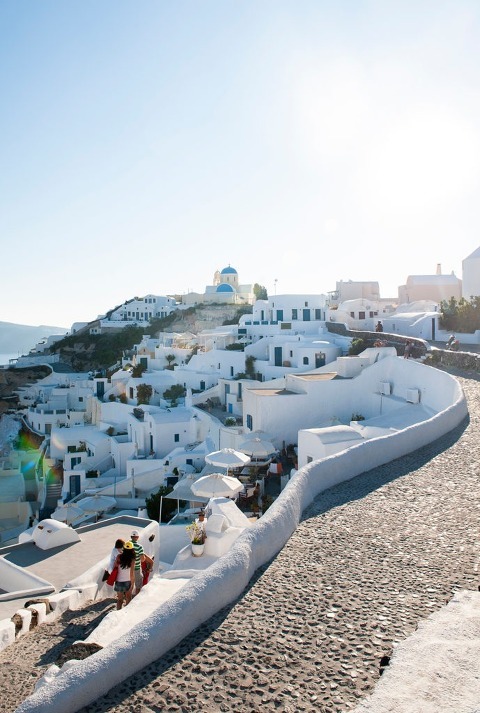 Santorini – built on a volcanic island in the middle of the Aegean sea – was everything I wanted it to be, and I want more. And my oh my, it really was as blue as every photo I had ever seen. This was the longest port of call we had when actively cruising…so what do you do when you only have one full day on a beautiful Greek island? You MAXIMIZE. One way to see the whole island on a budget is to rent an ATV. They are legal to drive everywhere and allow you access to off the beaten path places. And they’re tons of fun. 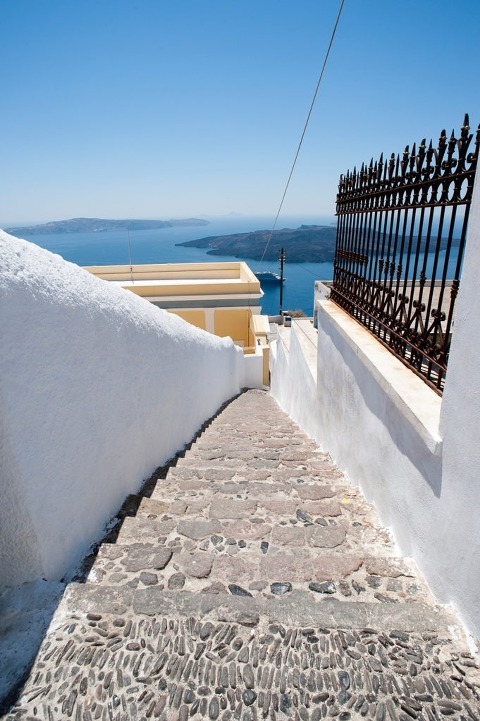 We went to Fira, Oia, Pyrgos, and back again. Spend some time drinking wine with a view (like, there is a view everywhere!). We chose Santos winery – twice. Once for a quick tasting and then back again at sunset for an epic view. 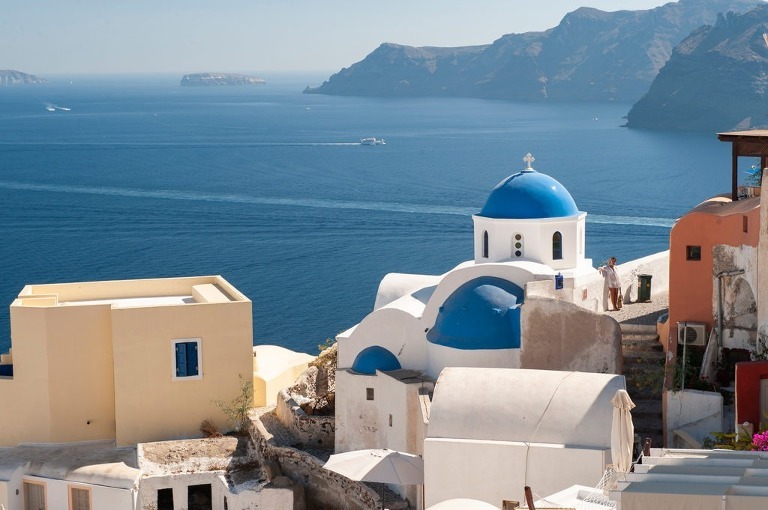 It may surprise you to think of the volcanic and visually barren islands of Greece being capable of supporting grape vines, but they are cultivated there and local wines have a very unique flavor profile. The volcanic black sand beaches beneath Oia is the perfect reprieve when it gets too hot to breathe, and taking a much deserved swim in the Mediterranean waters, while maybe not cool in temperature in the summer, is still ultimately relaxing and refreshing. Feta is a cheese made from sheep and goat’s milk that hails from Greece. I had a lunchtime salad at a café with a sea view that had the most delicious hunk of feta cheese I’ve ever had on top of it. It was literally the equivalent of a whole grocery store package on the salad. And I ate every bite. Look for all the color. The blue topped buildings against the blue ocean are so striking and postcard – perfect, but there was color everywhere – from the laundry hanging on the lines to the Crayola-crayon colors gracing every door, gate and flower box. Truly vibrant and delightful. It’s been awhile since I had the pleasure of experiencing Santorini, but looking back through my photos from this trip made me move it to the top of my “travel soon” list because it was truly amazing.